Have you ever had a haircut go horribly wrong? 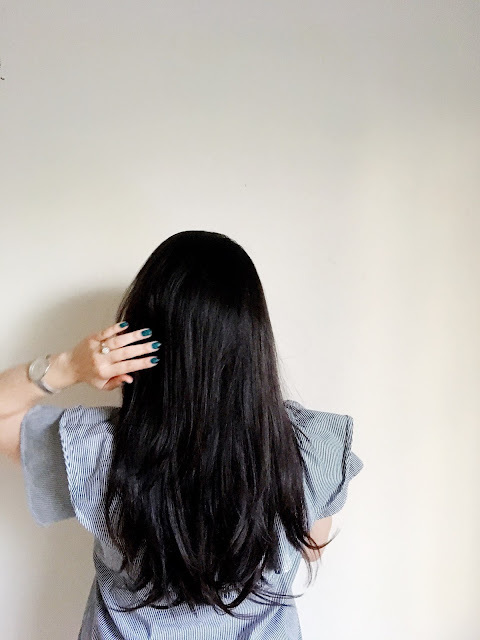 It's not the end of the world, but in the case where a hairstylist lops off more of your locks than you anticipated, it can feel incredibly crummy. A year ago my steady hairstylist of 3+ years cut closer to four inches when I asked for just one inch off, to say I was upset is a bit of an understatement. That stylist and I, well we broke up and I spent that night looking online for hair extensions. I wish I had found the Milk + Blush website! A few months ago a representative of Milk + Blush got in touch with me and after browsing the website, I was convinced that these were the extensions that would have suited me best. I truly had been considering purchasing extensions before I was approached, to have a thick head of hair. My hair is thinning and quite limp, so the appearance of volume is a primary goal, length is secondary to thickness. Milk + Blush Triple Weft extensions definitely deliver in that regard, as the full set more than doubles the amount of hair on my head. My biggest concern was color matching, how was I to find the shade right for me through online pictures? M+B has that covered. By looking at (unfiltered!) photos of your hair, the Milk + Blush team can walk you through the color options and suggest one that would be a good match. They were able to confirm my initial guess that the color Good Vibes looked like it would really suit me. There's a testing weft that is packaged separately so that you can try it against your hair without opening the rest of your extensions. For me, Good Vibes was a perfect match. It's a warm off-black. 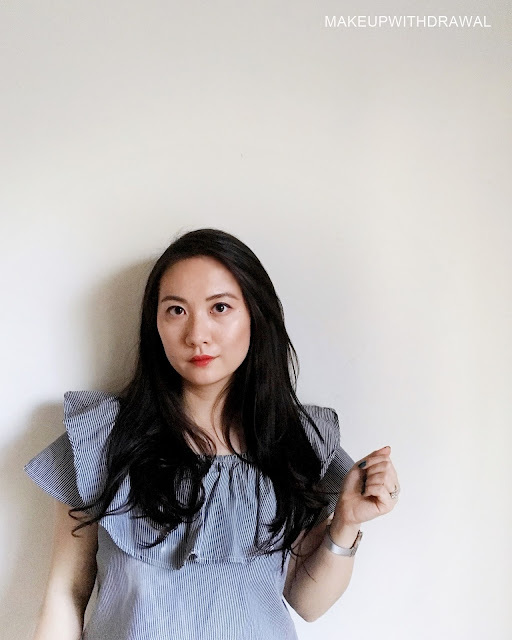 What I was really happy with was that the texture and coarseness of the Triple Wefts matched my hair perfectly - I have really fine hair and was thrilled that the extensions and my natural head of hair were indistinguishable when grouped together. It's completely natural looking, you would have to lift up the hair on my scalp in order to to see the clips to know that these locks aren't completely mine. Can you tell where my hair ends and the extensions begin? Pretty good match! I'd recommend a few other odds 'n' ends to get the most out of your extensions. 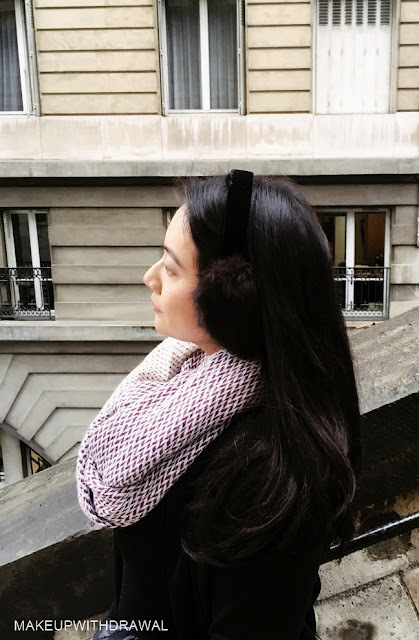 In addition to mini bobby pins in your hair color, I'd make sure to have a high quality, seamless comb for backcombing and sectioning your locks. I went with metal tailed one from Cricket that has no seams. A silicone heavy product, as recommended by Milk + Blush, would also lend your extensions extra softness and shine. This was the wefts right out of the box. Some flyaways from being inside the case, the hair itself was really smooth and healthy. Actually my spouse remarked that overall the hair looked a smidgen glossier and healthier than my own. Impressive since my hair is virgin, in the sense that it hasn't been colored or any other chemically process, and overall is in pretty good shape (if sparse). The Triple Weft set includes seven pieces totaling 160g worth of Remy hair spread out over 18 clips. Placing a front weft (one of the 2 clip). 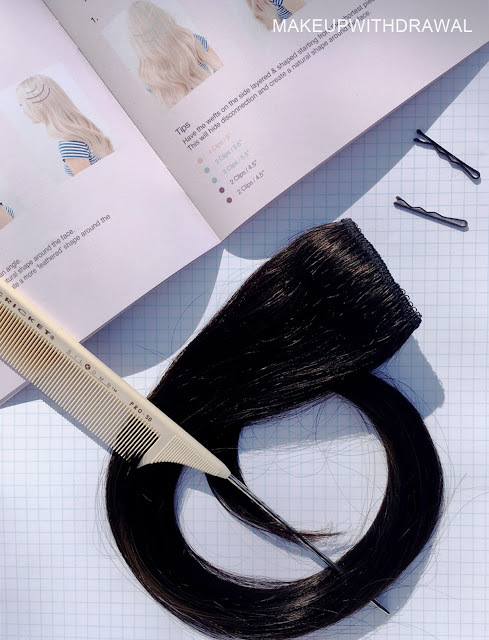 Using the comb, section off horizontal (and in the front, diagonal) slices of hair and backcomb "cushions" of hair for your wefts to clip into. Clip the extensions as close as you can to the parting line. The bobby pins are handy for extra security, the shortness means you can place them tangentially to the curve of your head and they won't really stick out. Follow the placements in the booklet, angling away from the face with the front pieces means that the hairline looks normal all the way around your face, even if you pull your hair back the wefts are hidden. Even just wearing a part of the set makes for a remarkable improvement. 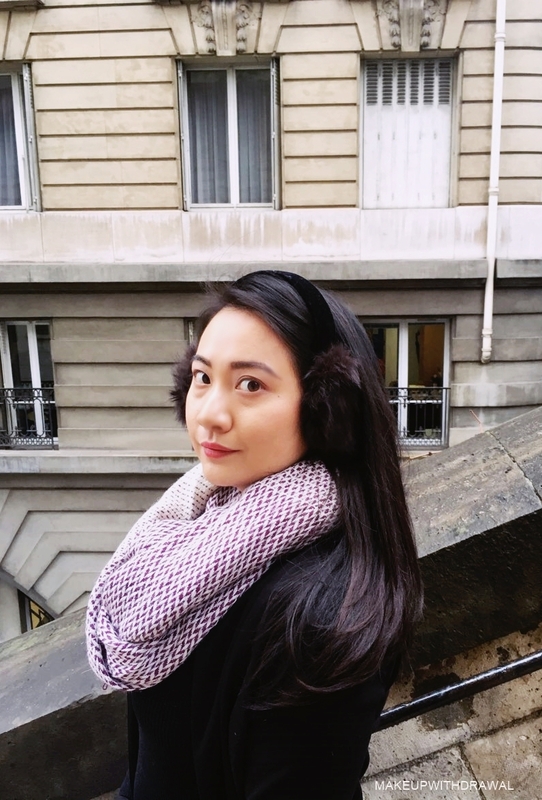 I brought two of the 2 clip and one of the 3 clip wefts (so a little over ~60g of hair) with me on our last trip and loved wearing these wefts for an improved, natural daily look. I have one 2 clip on either side of my head and a 3 clip curved around the widest part of my parietal bone. I'm pretty tender-headed but I can easily wear three pieces on a daily basis. If 60g was pleasing, the full 160g made me happier than you can imagine. So much volume! I've always envied the thick, full mane of my mother and now I can clip in the hair that I didn't inherit. Kinda tousled casual wear, your girl here doesn't like to fuss with curls. Now that they are a bit longer than my real hair's length, the ends of the extensions are a bit more wispy looking past the bulk of my hair. I intend to ask my hair stylist to trim the extensions while attached to me head the next time I have a hair cut, so that the wefts would flow with the haircut that I have and look more solid around the perimeter. I am really pleased to have these extensions. 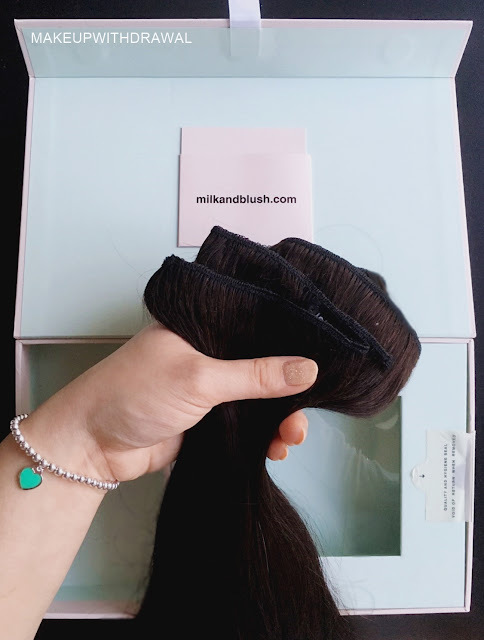 If I was ever in the situation again where more of my hair was cut off than I had wanted (fingers crossed this doesn't happen), I would not hesitate to order these extensions from Milk + Blush. Actually just for the beautiful additional volume, I'd want to have these clip ins. It puts an extra spring in my step - hair really plays into my confidence! This full set of Triple Weft Extensions are $191 for seven pieces. I may have saved the best news for last: ombre shades! As someone who doesn't want to color their own hair, this is totally up my alley. If you wanted to up the ante, there's even an Quad Weft set and an Extra Thick Quad (I can't wrap my head around how much volume these must give!). 10/10. These were sent to me for review, I'm so happy with these extensions that I would definitely look to Milk + Blush for all my future extension needs. Product featured was sent to me for review. For additional information, please refer to my Disclosure Policy.